With a roundhouse kick to the right and a spinning back fist to the left, Karate Pig has all the right moves. Jump in and join this fun loving porker and his snouted cronies. 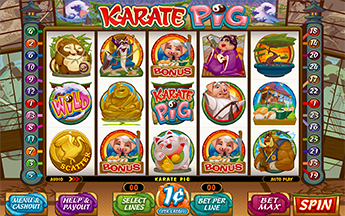 Take a journey through the action packed multi-level bonus feature or reap the rewards in the Free Spins with reels 1 & 5 wild! •Level 1 has 6 icons, pick to reveal prizes and advance to Level 2; Advancing on the first pick awards 2x total bet. •Level 2 has 6 icons. 4 prize icons and 2 end of bonus icons. Pick until all prize icons are selected or both the end of bonus icons are selected. Selecting all prize icons will advance to Level 3. Selecting both end of bonus icons will end the bonus round. •Level 3 player picks 1 of 2 choices. One choice will advance to final pick; the other will end the bonus. Final pick may result in an additional award and end the bonus round. Win up to 173x total bet. 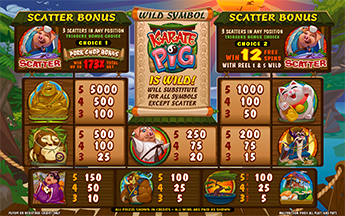 Choosing the free spin bonus give you 12 free spins, with reels 1 & 5 always wild during Free Spin round.